Maria Brenes leads a student panel during the Transform Learning LA convening. Anthony Emerson, a student in Harvard’s Doctorate of Educational Leadership program, has been working with CCF for the past 10 months to help us better understand the needs of students across L.A. County and develop a plan that will inform our efforts to strengthen Los Angeles’ education pipeline. This week, he is scheduled to present his findings to his doctoral defense committee at the Harvard Graduate School of Education. In this post, discover what he’s learned about Los Angeles, our education system and how we can transform it to ensure all of our students have the tools they need to reach their full potential. What do we want the future of education in Los Angeles to look like? Should it be a system that embraces equity and innovation while meeting the needs of a diverse set learners and preparing them to thrive in today’s world? Is it a system that prioritizes personal wellness, civic engagement and community empowerment alongside academic outcomes? Is it one that allows teachers to be treated with dignity while also giving students’ space for personal growth? If this is our full vision for education, then we must embrace it as a community. Unfortunately, the education system in Los Angeles County is one that works for some students, but is all too often failing our students with the greatest needs. The most recent data shows that only one fourth of Los Angeles Unified high school graduates earn a college degree within six years. If we want to prepare the next generation of great thinkers and doers, the education systems of today and tomorrow require a fundamental transformation from an industrial design to a more equitable design; one that is informed by the community and by how today’s students learn best. CCF saw an opportunity to bring thought leaders together to shape a brighter future for our education system, and convened a diverse group of L.A. County stakeholders to reimagine learning environments in K-12 public schools by focusing on the whole learner. Our conversations from the day were meant to inform CCF’s future grantmaking and community engagement activities. Education Program Officer John Garcia tweets from the Transform Learning LA panel. An audience of over 100 community leaders that included researchers, educators, policymakers and students participated in small group discussions and heard from visionaries throughout the day including distinguished professor of education at UCLA Pedro Noguera, David Rattray, the executive vice president of the Center for Education Excellence at the Los Angeles Chamber of Commerce and L.A. Unified board member Nick Melvoin. 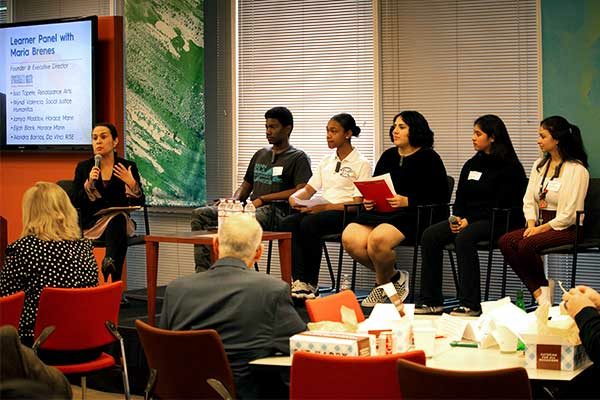 Our community partner and the executive director of InnerCity Struggle, Maria Brenes, led a panel of student voices who shared how they have experienced learner-centered education in schools across L.A., including Social Justice Humanitas Academy, Renaissance Arts Academy and Da Vinci RISE High School. The students challenged us to think outside the box by letting go of practices that inhibit learning and instead focus on qualities that enhance learning by prioritizing personal development, making learning meaningful and expanding less-traditional supports like mental-health check-ins. Some of those students share more from their experiences in the video below. Through this collaborative process, we learned that the whole learner approach –which considers different aspects of learner development like social and emotional growth as well as physical and mental well-being in support of academics– is effective. But embracing systemic change toward whole learner education as a community means all of us moving collectively together to enact this vision; from the community-based organizations that offer critical support services, to the teachers who dedicate their time and energy in our classrooms every day, to the school leaders and policymakers who are making systemic decisions. We also know that student voices, in addition to educators and community members, must be at the center of our redesign efforts. That is why we invited students to spend their day listening, learning and planning together with us. This is only the first of many conversations as we continue this journey together to transform learning for our students. To learn more about the #TransformLearningLA movement and how you can join the conversation, please click here.